http://flevy.com/blog/wp-content/uploads/2019/03/shutterstock_572078809.jpg 500w" sizes="(max-width: 300px) 100vw, 300px">Franchising is the application of several operations practiced by another company’s successful business model. The franchisor is the supplier, while a franchisee operates the establishment from another location, but under the same brand. It’s a long-term business relationship wherein the franchisor provides licensed privileges to its franchisees. Pizza Hut is an excellent franchise opportunity for individuals seeking to do business in the pizza-making and serving industry. Yum! Brands, Inc. owns Pizza Hut, Inc., and has over 6,200 restaurants in the US according to Franchising.com. Its parent company also owns other restaurant chains like Kentucky Fried Chicken, A&W Restaurants, and Taco Bell. This fast food giant began with Dan and Frank Carney back in 1958, and continues to serve pizza and other dishes in several locations across the globe. As a Pizza Hut franchisee, you still need to follow specific guidelines for the business to become a success. You may even want to do a cost analysis at franchiseknowhow.com to check if putting up this pizza place in your area promotes valuable rewards. Aside from doing a cost report, there are factors you need to consider to help ensure and sustain success from your business venture. Franchisors offer help in merchandising, marketing, organizing, and training the franchisee and the new employees. The success of the Pizza Hut name depends on the achievement of the franchisee. It’s important to learn the necessary parameters to become successful in this sector while carrying the company’s name. Understand that Pizza Hut, as a franchisor, cannot fully guarantee the success of the restaurant chain. If you, as the franchisee, don’t do well for the accomplishment of the restaurant’s location, then it can deal significant blows to the whole franchise. These processes can help independent units integrate the company’s overall operational model to achieve desired results with better speed and efficiency. Any franchise opportunity starts with a letter of intent. 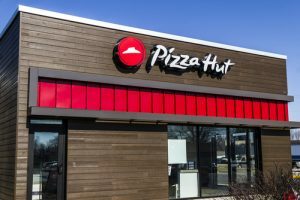 You can’t expect Pizza Hut to approve your franchise application by stating, “I want to put up a restaurant” without giving any specific details. Research about the necessary factors to make the fast-food chain as successful as possible in your desired location. Put your best foot forward during the application process for the pizza chain to see your goals match with their objectives. One particular area to highlight in your letter of intent is the location of the establishment. The information should look at selling opportunities within the region. For example, you might plan on putting up a Pizza Hut restaurant in a busy commercial district, which presents several business opportunities. Conversely, if you try to put a restaurant in the middle of a desert, Pizza Hut might reject your application because of the slim chances of sales. Once you have the Pizza Hut chain in a desirable location, train your staff to provide the best customer service they can muster. Word will travel fast regardless of a positive or negative nature. If you and your employees deliver excellent customer service, you may expect more people to knock on your door and order several slices of pizzas, or whole pies at a time. A similar thought applies when you don’t offer excellent customer service. People will post negative reviews about your particular establishment. The power of the Internet and social media connects your Pizza Hut establishment with the world. If one customer posts a negative opinion about your franchised restaurant, your sales figures may suffer. It’s essential to remind yourself that any significant Returns on Investment (ROI) won’t happen overnight. Think about short- and long-term goals while considering that gaining profit will take time. Don’t forget to ensure profit sustainability as one of your primary objectives as a franchisee. Pizza Hut, as a franchisor, will need to see a realistic approach of your ROI expectations to help in the growth of the brand. Pizza Hut is a popular name in the pizza serving sector, as the brand serves pizza and other food to its customers. Becoming a franchisee of the company may present you with good cost and profit opportunities. It still needs you to do the necessary actions to help ensure your new business venture won’t go down the drain.